OneCNC is a CAD/CAM software productive right out of the box and there is plenty of evidence to prove it.. Many years of development and direct interaction with customers has created a CAD/CAM that made this possible. Seamless integration of OneCNC 3D CAD and CAM offers an intuitive unique user experience. No fancy tool path names and no outrageous claims just world class machining technology right out of the box. OneCNC pioneered high speed machining which is a standard feature in CAM Milling at no added cost. Here is a video that shows a part being machined on a HAAS VF2 vertical machining centre programmed with OneCNC. There are thousands of OneCNC customers just like this using HAAS Machines to produce parts on time. If you would like to be part of this "on time at reduced cost" CNC parts production contact your local OneCNC office >>. Computer modelling has advanced to a high level using free form Nurb surfaces to create complex models. After design often these parts then have to be manufactured. This advance in modelling has required CAD/CAM development to keep pace with the complexity of machining parts that are modelled by this method..
At OneCNC as part of our ongoing product development we often choose what can appear to be simple parts but contain portions or features that can produce complexities in CNC manufacture. 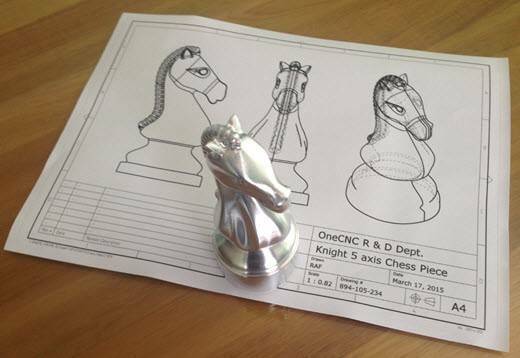 A Chess Piece Knight was chosen as an example in this instance because it was small and shows the detail required to machine the undercut areas of the model both in the roughing and finishing of the part.. While testing our OneCNC Expert 5 Axis Simultaneous functionality to produce a part like this Knight Chess Piece we made a video of the machining to show our progress. This video shows the results and the machine action action and movements required to machine this part of this type..
OneCNC has the facilities and the technical ability to conduct this type of development. OneCNC employs the latest CNC 5 axis simultaneous machining technology including the latest Laser measurement and tool setting. This helps to ensure that OneCNC has the capabilities of the latest machine technologies. If you would like to see completed parts from our Research and Development visit a OneCNC trade show exhibit and often you would see these components on display. OneCNC 5 axis "Swarf" machining in OneCNCXR6. Swarf Milling is a type of Surface Milling or machining which lets the user machine a singular or series of surfaces by cutting with the side of the tool. Swarf Milling produces a slice style tool path, with the slice shape corresponding to the 5-axis suitable surface being machined. The tool is positioned tangent to the surface being machined and the suitable surface is straight rather than bulged. OneCNC on selection of the Swarf function indicates by way of colouring each surface that can not be Swarf machined on the current screen part. Parts that have bulge or do not have tangent to the tool ability are shown as black surfaces, all other surfaces not coloured can be Swarf machined. Swarf Milling supports end mill tools, as well as tapered end mills and ball mills. This video shows some of the OneCNCXR6 capabilities of the Swarf machining machining the tapered walls and chamfered edges of a cell plate. You will note that the tapered walls are finished in one pass of the cutter and the chamfered edges are also finish machined in one pass. The outer edge is undercut and also Swarf machined. Swarf Machining is a technique that is excellent for side cutting of a part, such as a tapered rib as another example. This next video shows the Swarf machining of the fins on the cylinder block. This application of using OneCNCXR6 5 axis and Swarf machining also saves a huge amount of machining time yet produces a finished result superior to other machining methods. The two videos showing the OneCNC capabilities of Swarf machining were machined on a Hermle 5 axis C400 5 axis machining centre in-house as part of our quality assurance testing of the OneCNCXR6 functionality. For any further details of OneCNC or an on-line demonstration demonstration please contact your local OneCNC office.